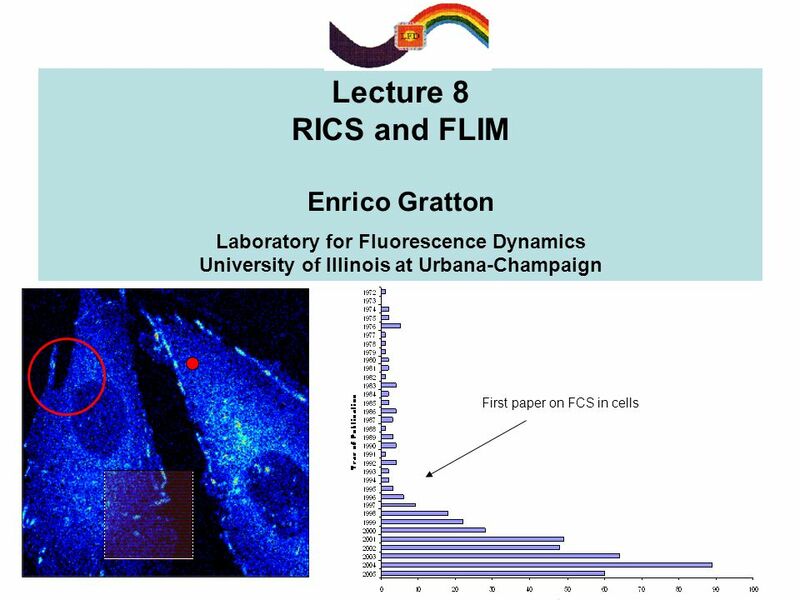 Lecture 8 RICS and FLIM Enrico Gratton Laboratory for Fluorescence Dynamics University of Illinois at Urbana-Champaign First paper on FCS in cells. 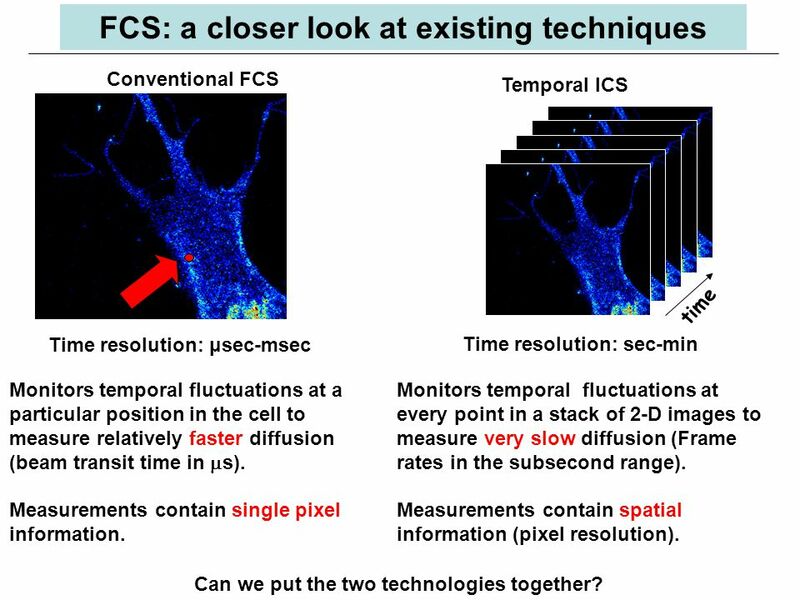 4 Conventional FCS Temporal ICS Monitors temporal fluctuations at a particular position in the cell to measure relatively faster diffusion (beam transit time in  s). 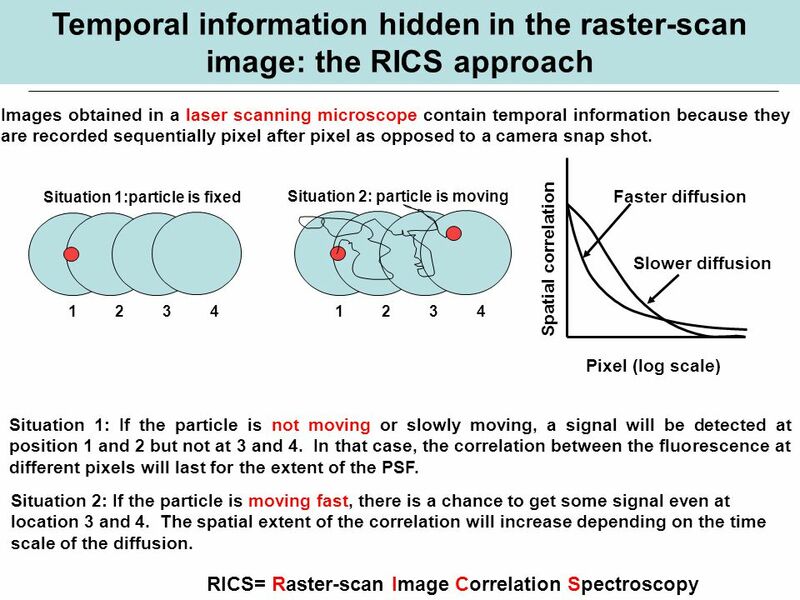 Measurements contain single pixel information. 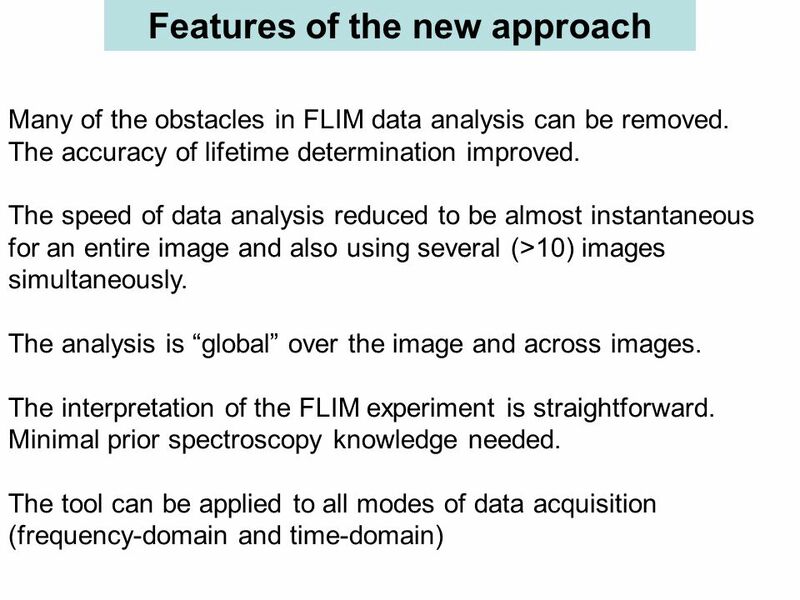 time Monitors temporal fluctuations at every point in a stack of 2-D images to measure very slow diffusion (Frame rates in the subsecond range). 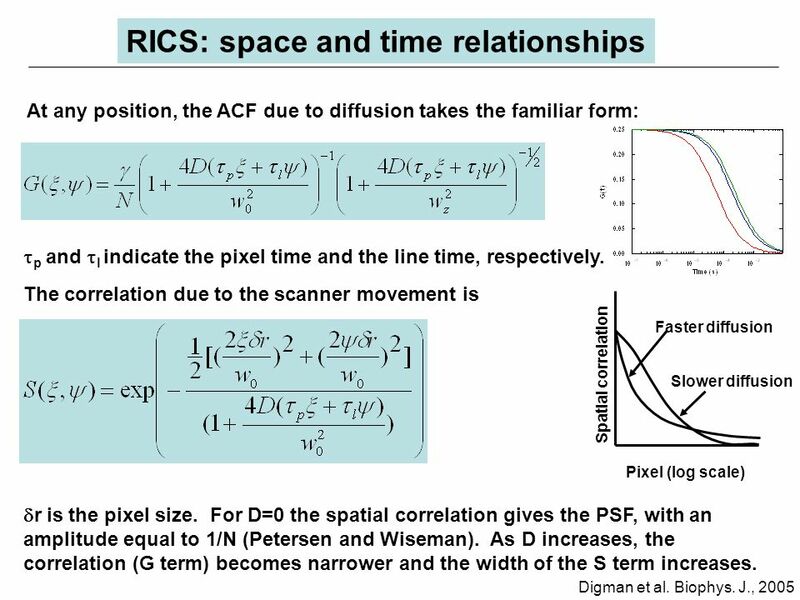 Measurements contain spatial information (pixel resolution). 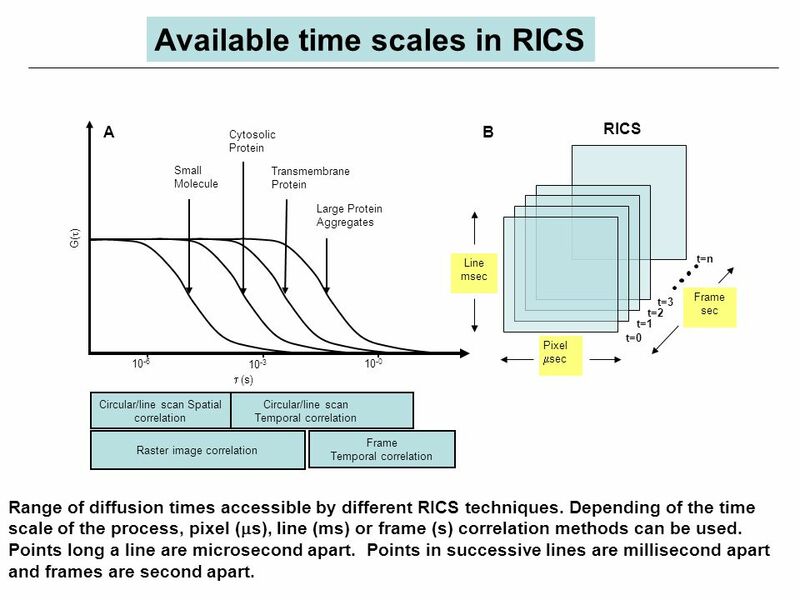 Time resolution: μsec-msec Time resolution: sec-min FCS: a closer look at existing techniques Can we put the two technologies together? 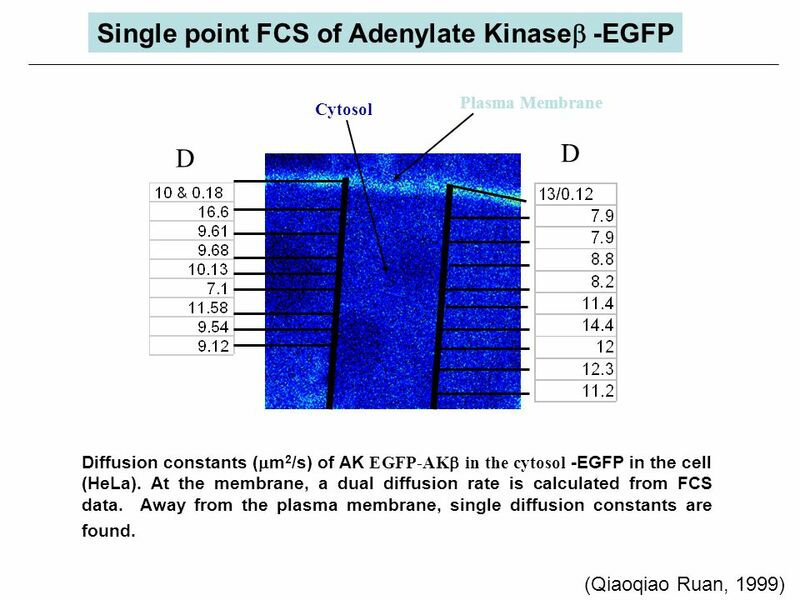 16 For molecules in solution, the method works fine. 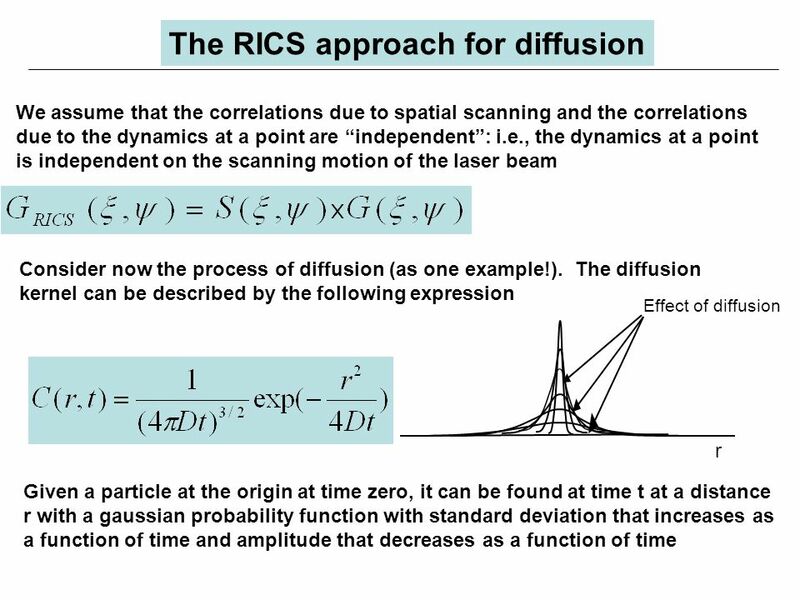 The same G(0) and the same D is obtained using single point FCS or the RICS calculation. 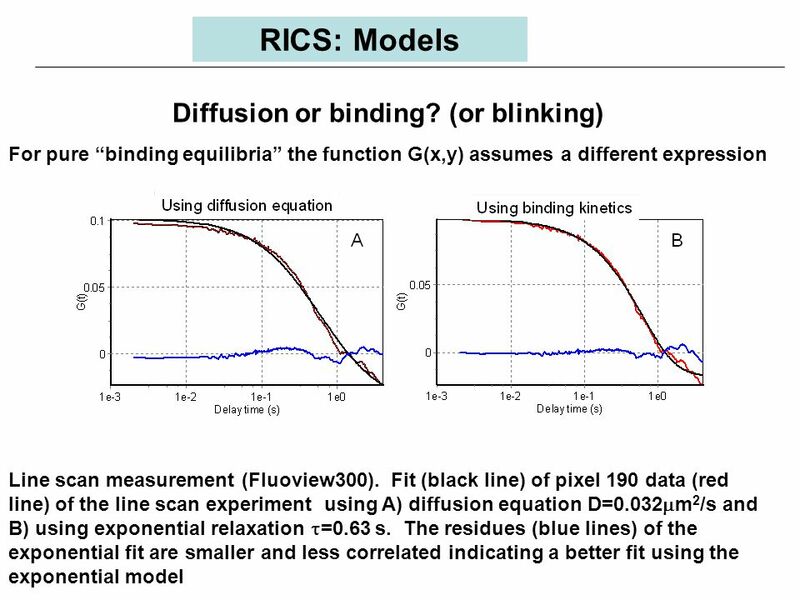 Simulations: comparison between 3 different methods to recover D and G(0) for 2 different values of D (100 mm2/s and 6 mm2/s). 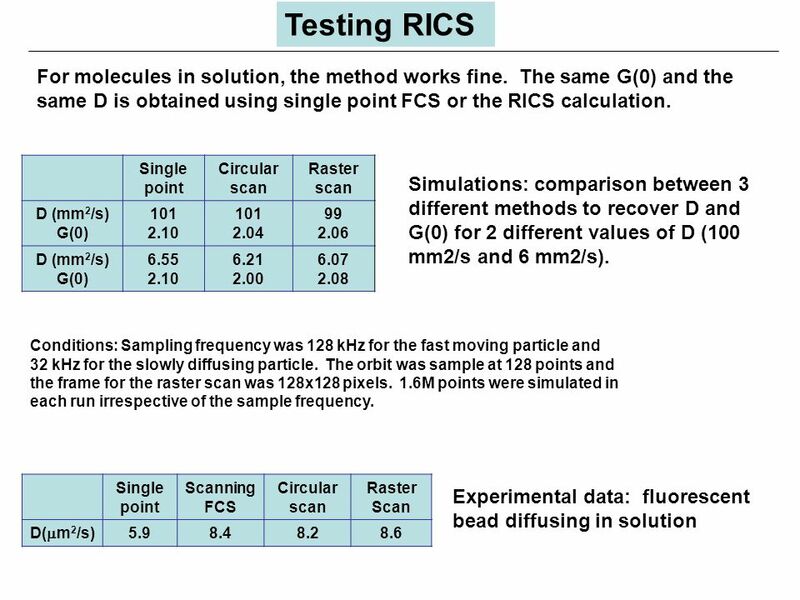 Single point Circular scan Raster scan D (mm 2 /s) G(0) 101 2.10 101 2.04 99 2.06 D (mm 2 /s) G(0) 6.55 2.10 6.21 2.00 6.07 2.08 Testing RICS Single point Scanning FCS Circular scan Raster Scan D(  m 2 /s) 5.98.48.28.6 Experimental data: fluorescent bead diffusing in solution Conditions: Sampling frequency was 128 kHz for the fast moving particle and 32 kHz for the slowly diffusing particle. 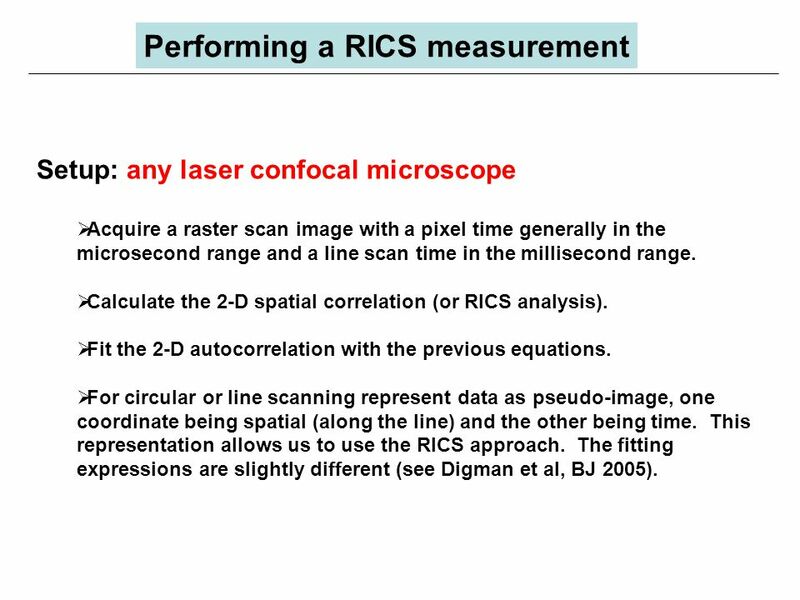 The orbit was sample at 128 points and the frame for the raster scan was 128x128 pixels. 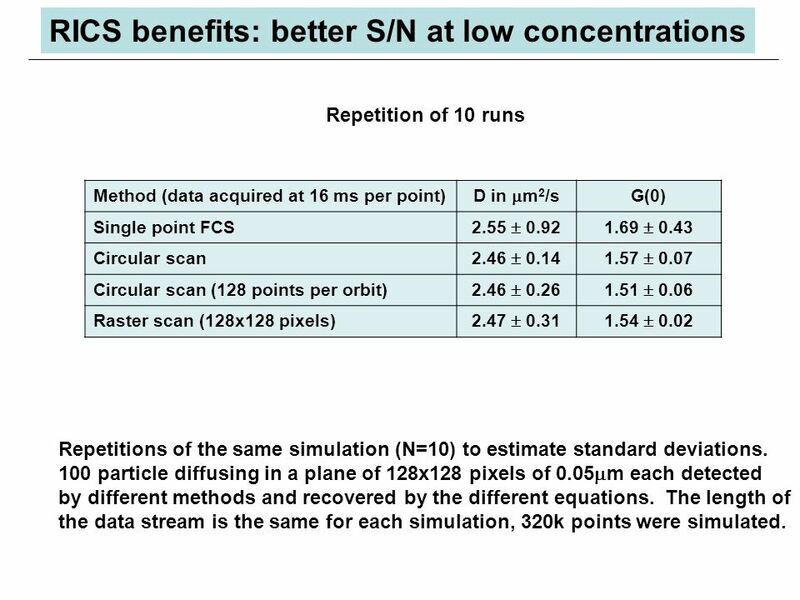 1.6M points were simulated in each run irrespective of the sample frequency. 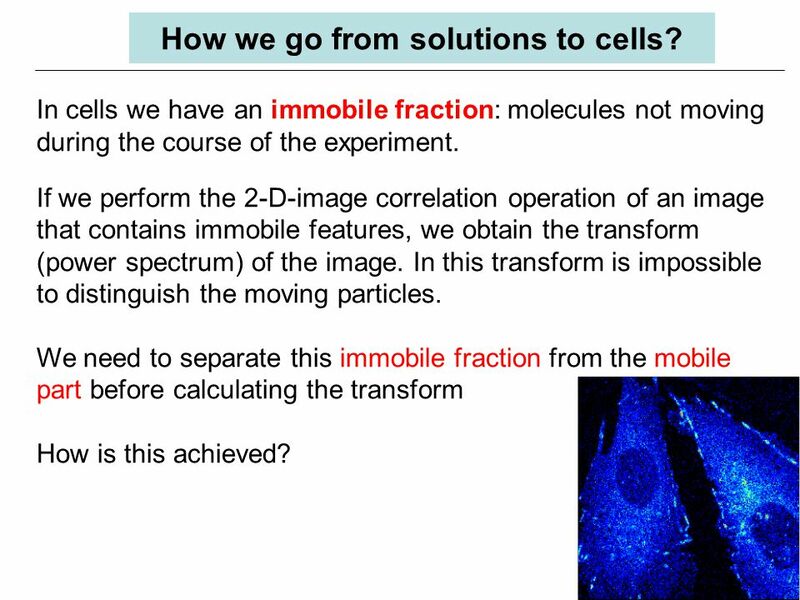 18 How we go from solutions to cells? 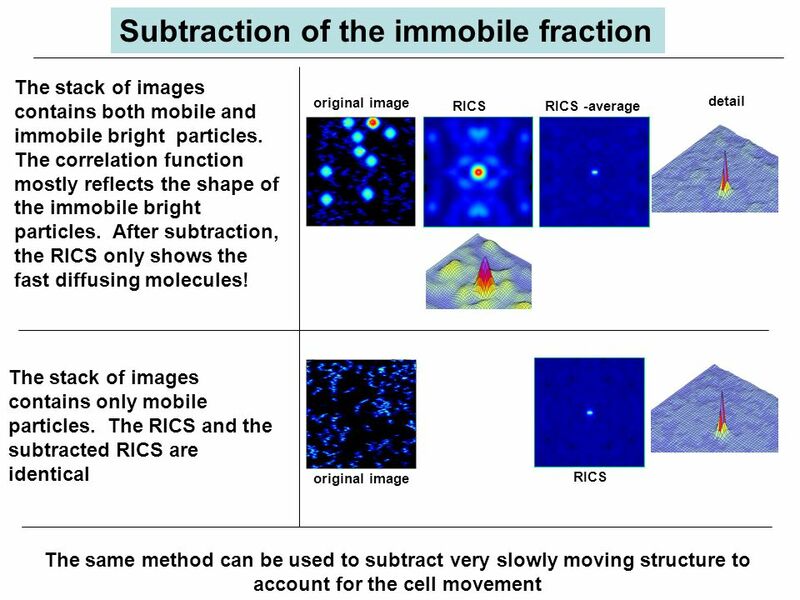 In cells we have an immobile fraction: molecules not moving during the course of the experiment. 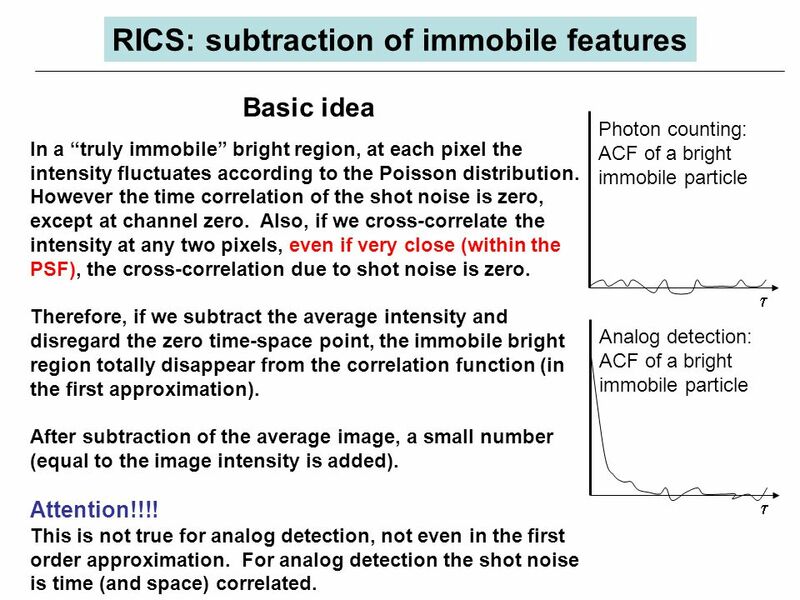 If we perform the 2-D-image correlation operation of an image that contains immobile features, we obtain the transform (power spectrum) of the image. In this transform is impossible to distinguish the moving particles. 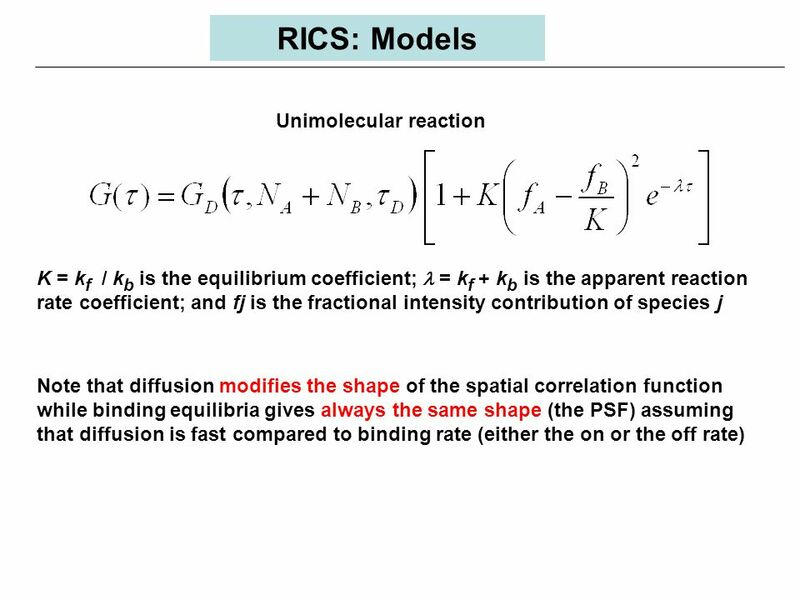 We need to separate this immobile fraction from the mobile part before calculating the transform How is this achieved? 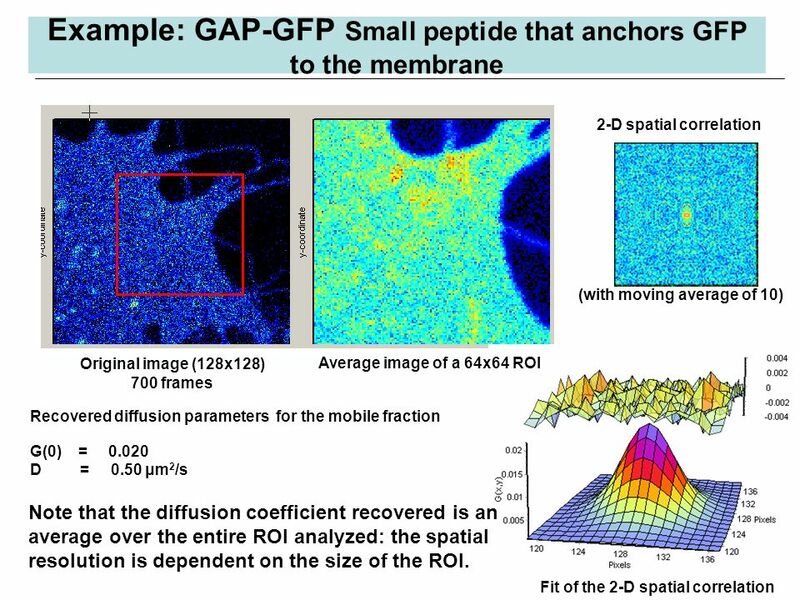 23 Example: GAP-GFP Small peptide that anchors GFP to the membrane Recovered diffusion parameters for the mobile fraction G(0) = 0.020 D = 0.50 μm 2 /s Original image (128x128) 700 frames Average image of a 64x64 ROI 2-D spatial correlation Fit of the 2-D spatial correlation (with moving average of 10) Note that the diffusion coefficient recovered is an average over the entire ROI analyzed: the spatial resolution is dependent on the size of the ROI. 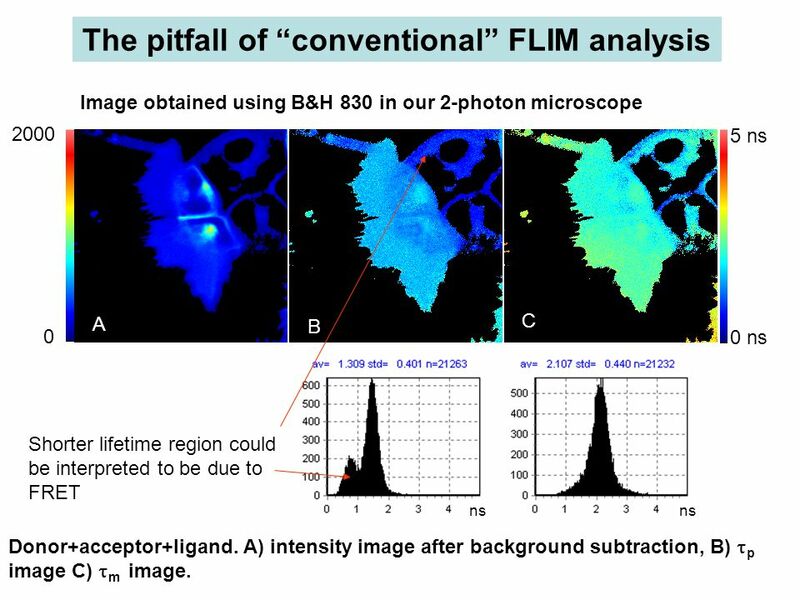 36 A new approach Presently, the analysis proceed by resolving the exponential components at each pixel and by identifying molecular species with lifetime components. 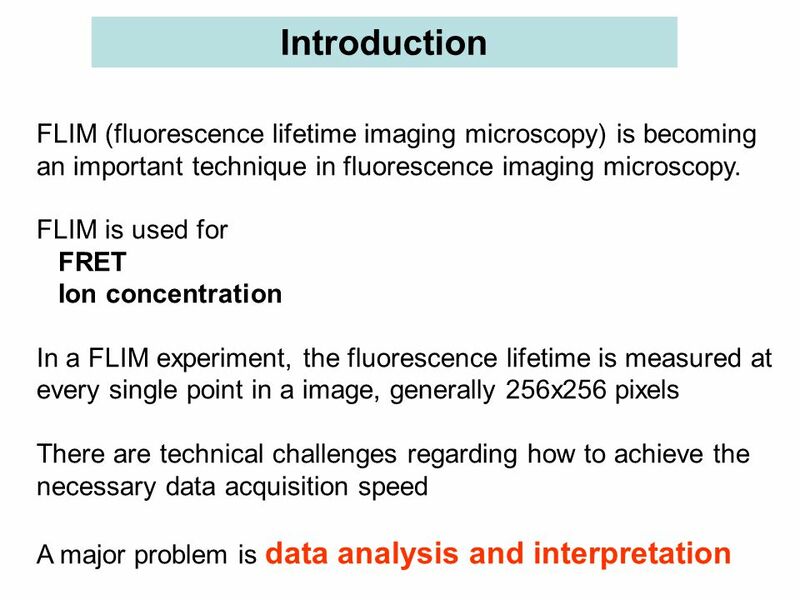 In the microscope environment, this process is prone to errors and depends on interpretation. 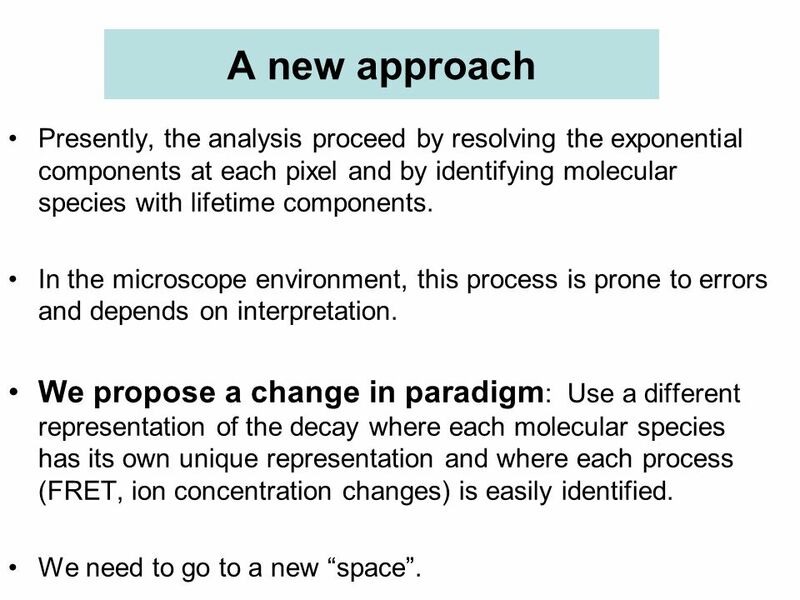 We propose a change in paradigm : Use a different representation of the decay where each molecular species has its own unique representation and where each process (FRET, ion concentration changes) is easily identified. 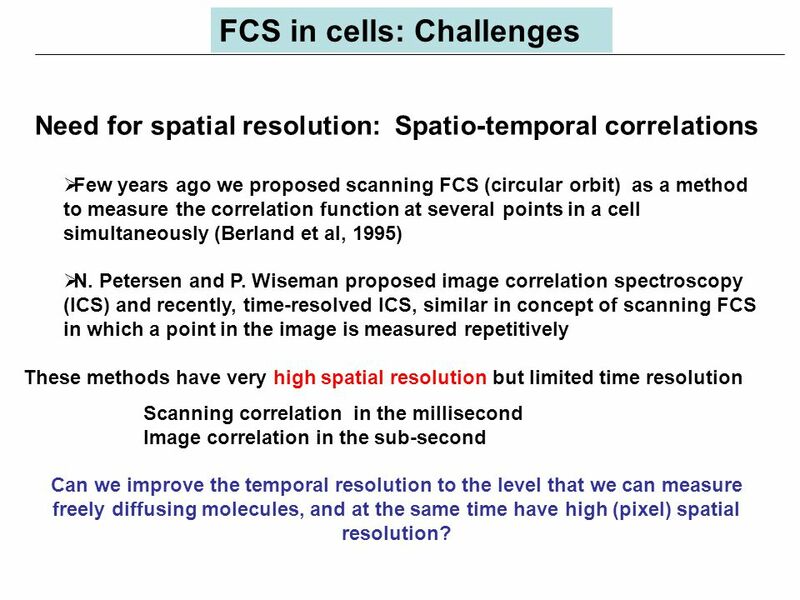 We need to go to a new “space”. 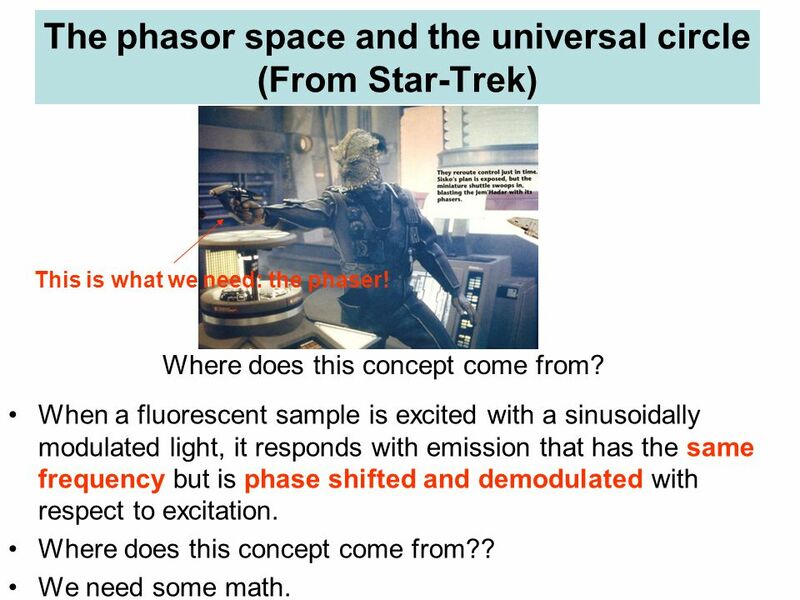 37 The phasor space and the universal circle (From Star-Trek) When a fluorescent sample is excited with a sinusoidally modulated light, it responds with emission that has the same frequency but is phase shifted and demodulated with respect to excitation. 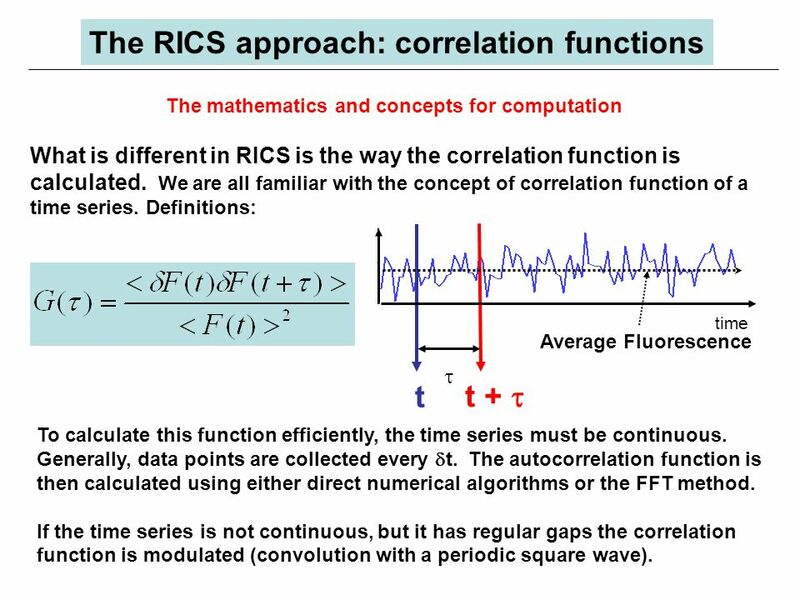 Where does this concept come from?? 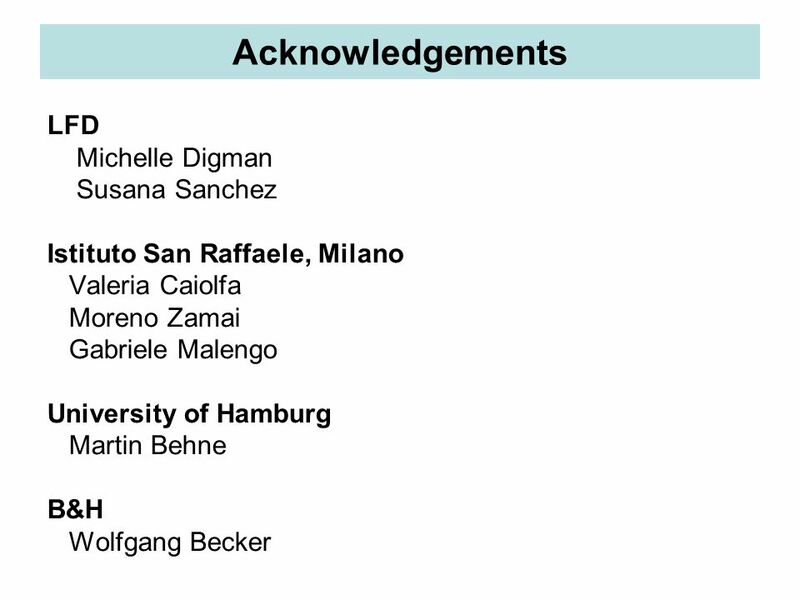 We need some math. 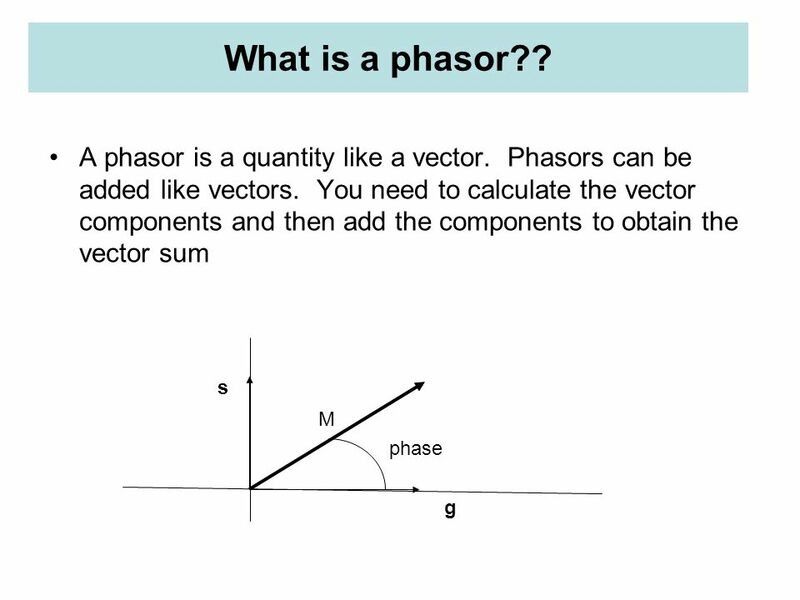 This is what we need: the phaser! 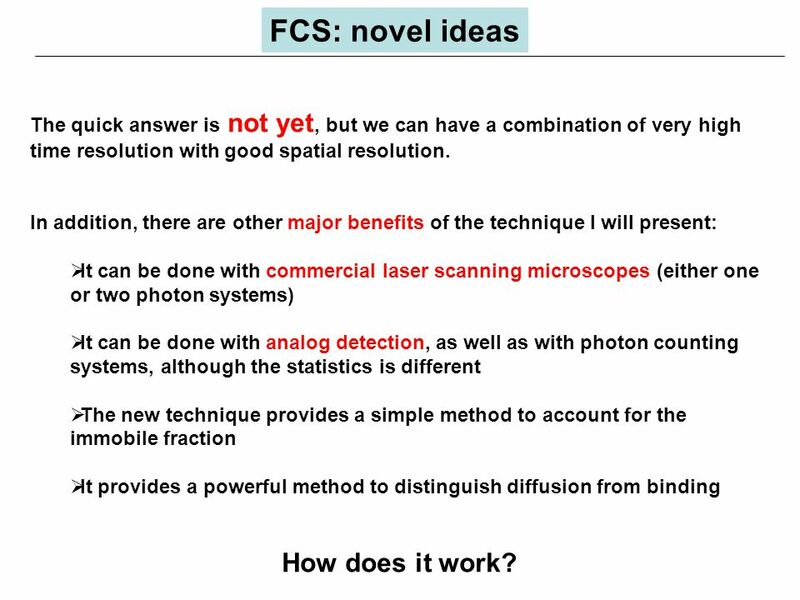 Where does this concept come from? 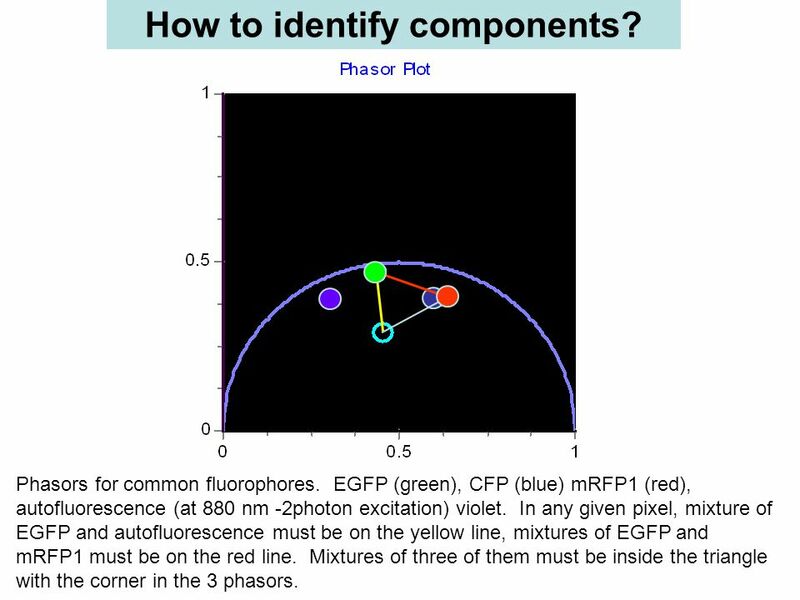 39 Frequency-domain components of a phasor. 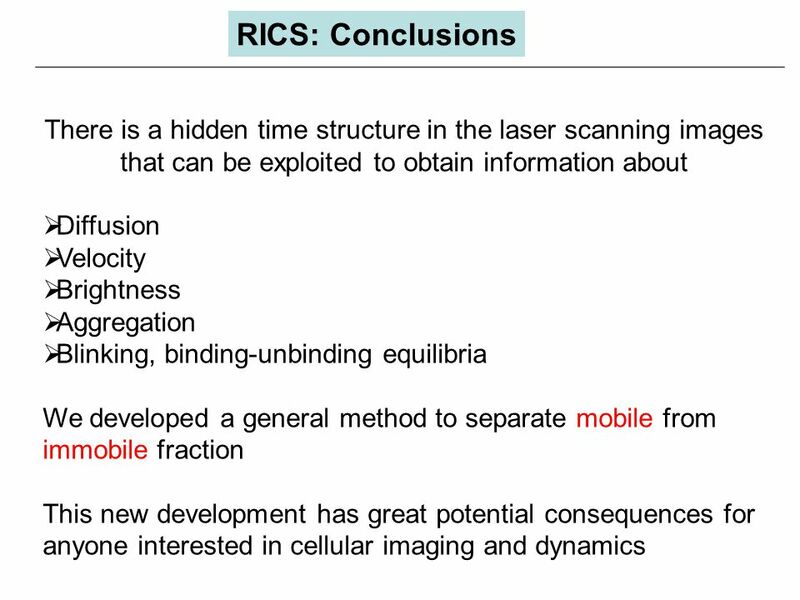 m and  is what is measured Time-domain components of a phasor. 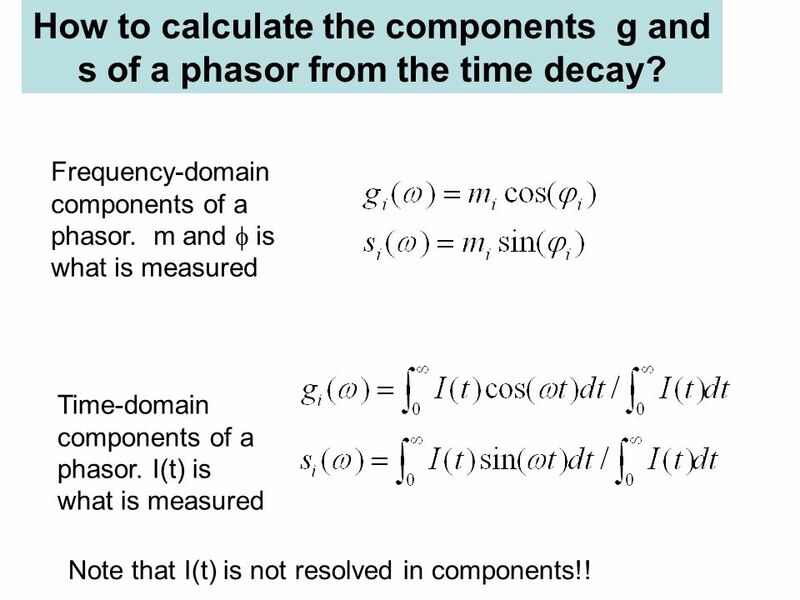 I(t) is what is measured How to calculate the components g and s of a phasor from the time decay? 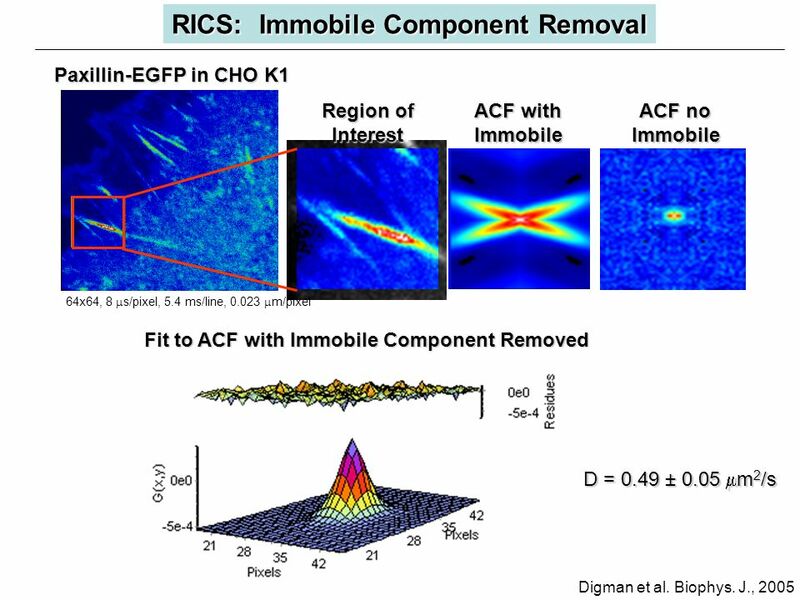 Note that I(t) is not resolved in components!! 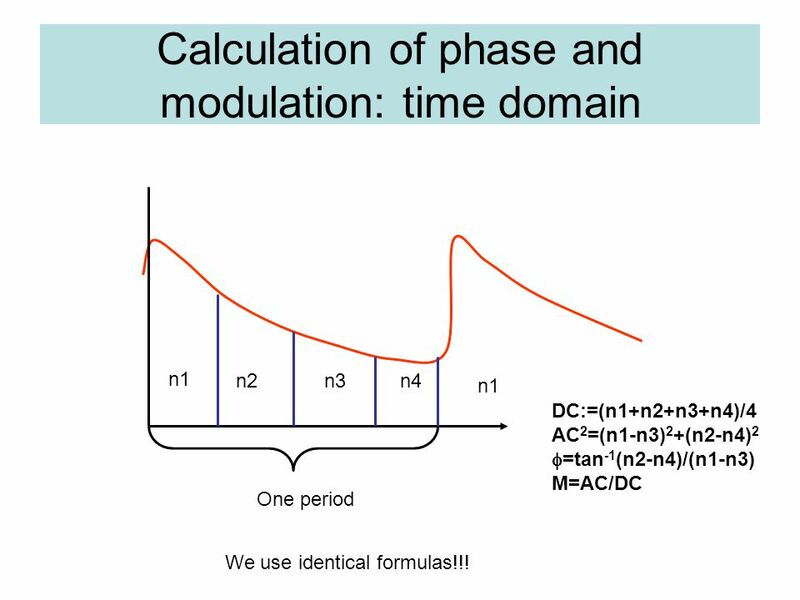 41 Calculation of phase and modulation: time domain n1 n2n3n4 n1 One period DC:=(n1+n2+n3+n4)/4 AC 2 =(n1-n3) 2 +(n2-n4) 2  =tan -1 (n2-n4)/(n1-n3) M=AC/DC We use identical formulas!!! 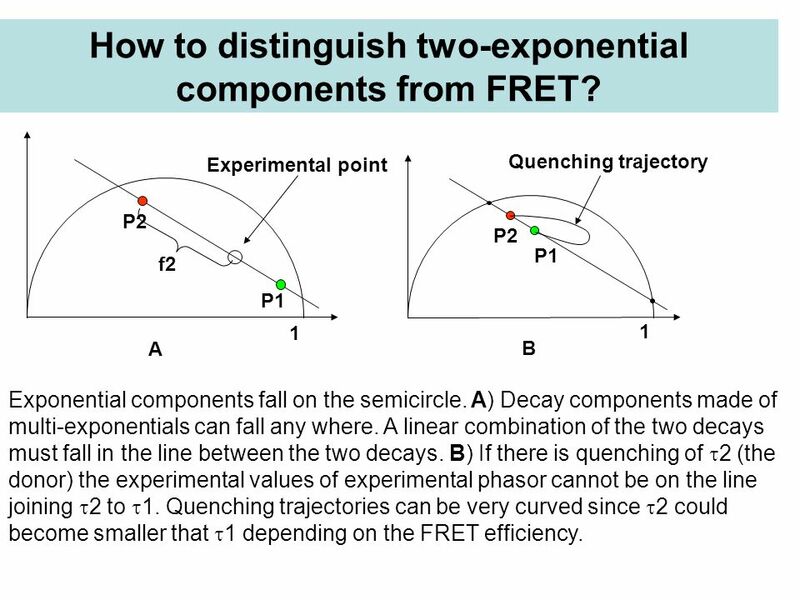 43 P1 P2 Quenching trajectory B 1 P1 P2 Experimental point A 1 f2 Exponential components fall on the semicircle. 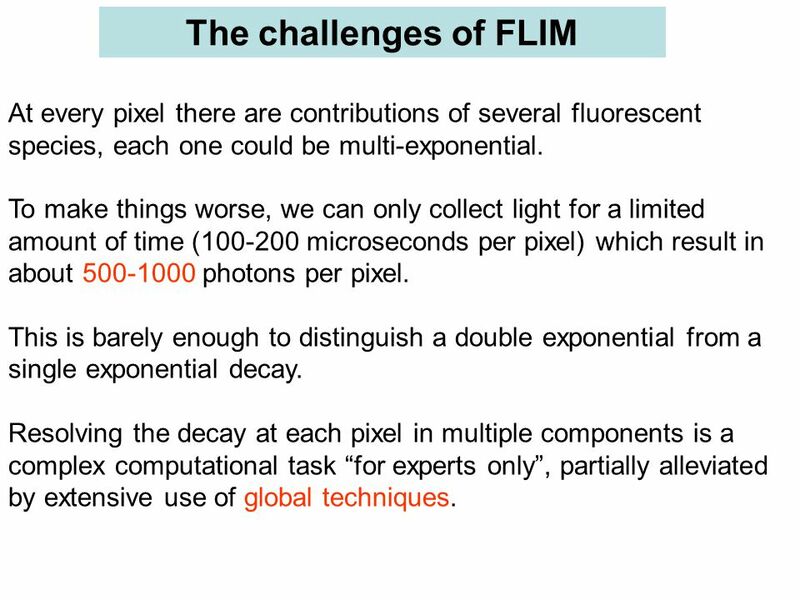 A) Decay components made of multi-exponentials can fall any where. 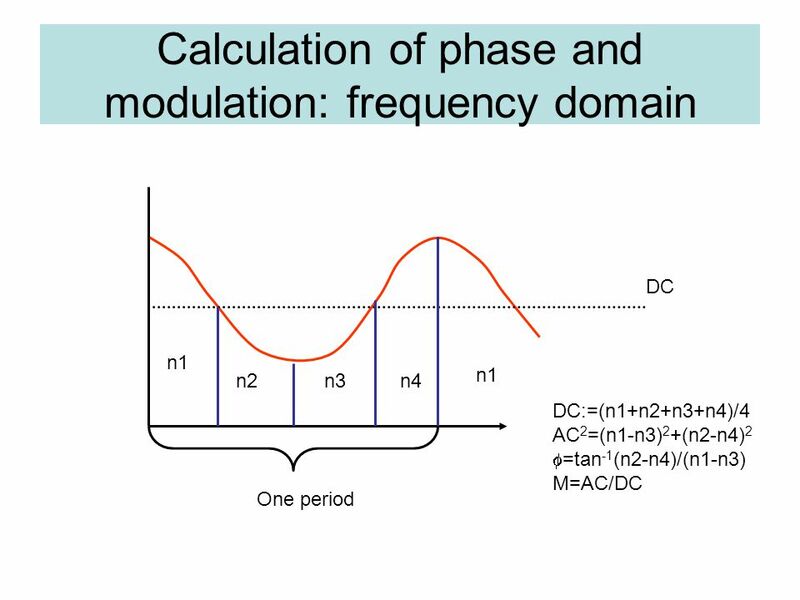 A linear combination of the two decays must fall in the line between the two decays. 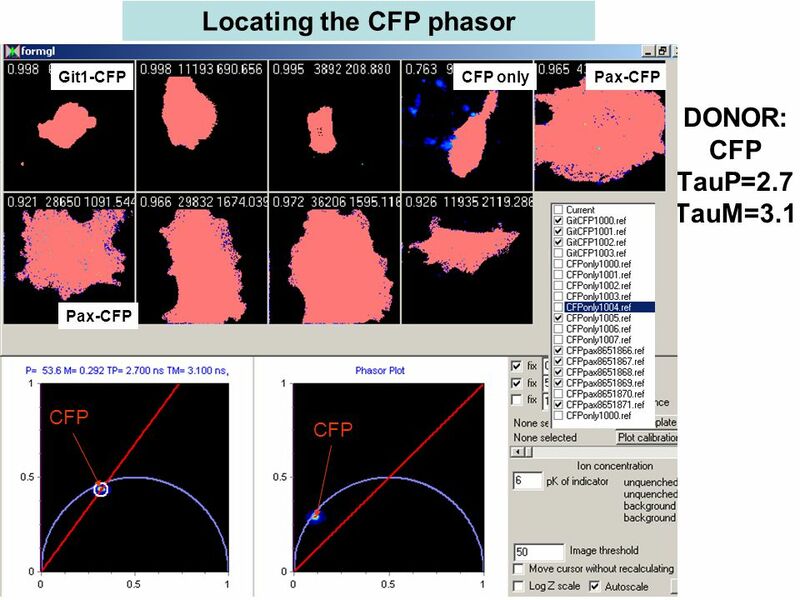 B) If there is quenching of  2 (the donor) the experimental values of experimental phasor cannot be on the line joining  2 to  1. 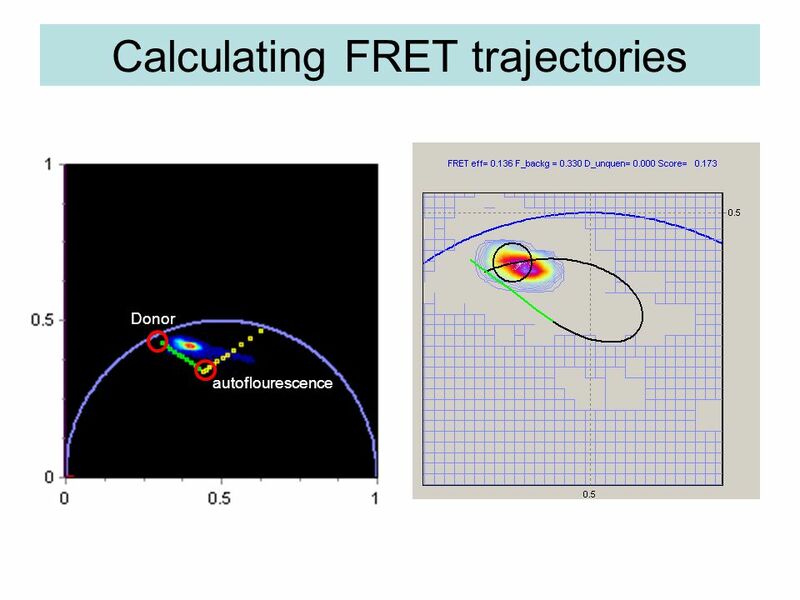 Quenching trajectories can be very curved since  2 could become smaller that  1 depending on the FRET efficiency. 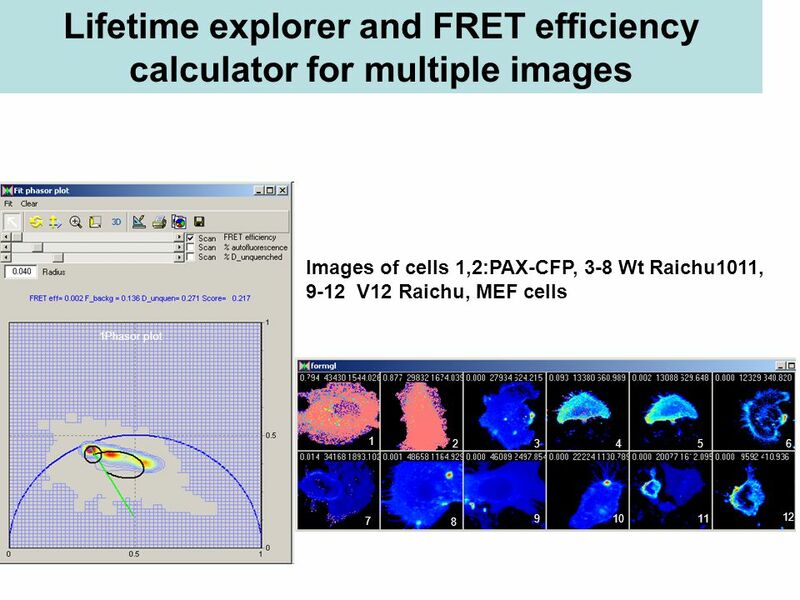 How to distinguish two-exponential components from FRET? 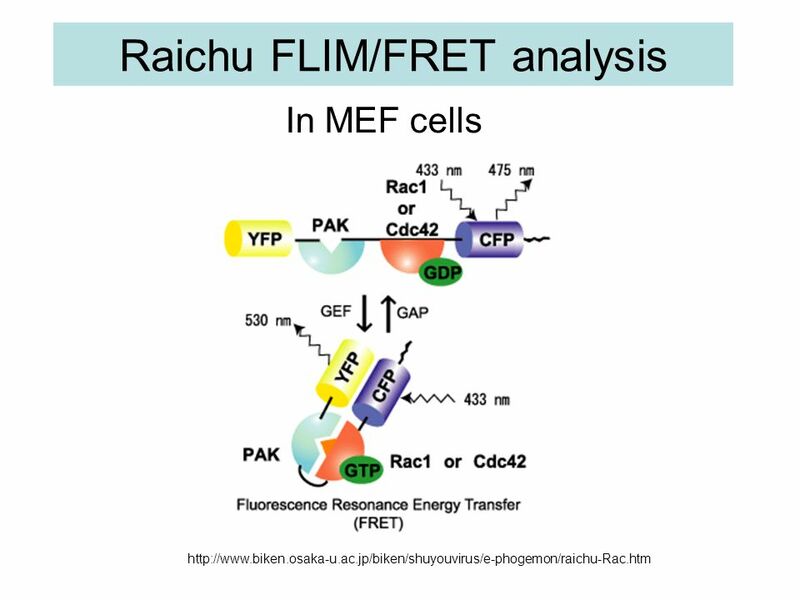 47 Phasors for common fluorophores. 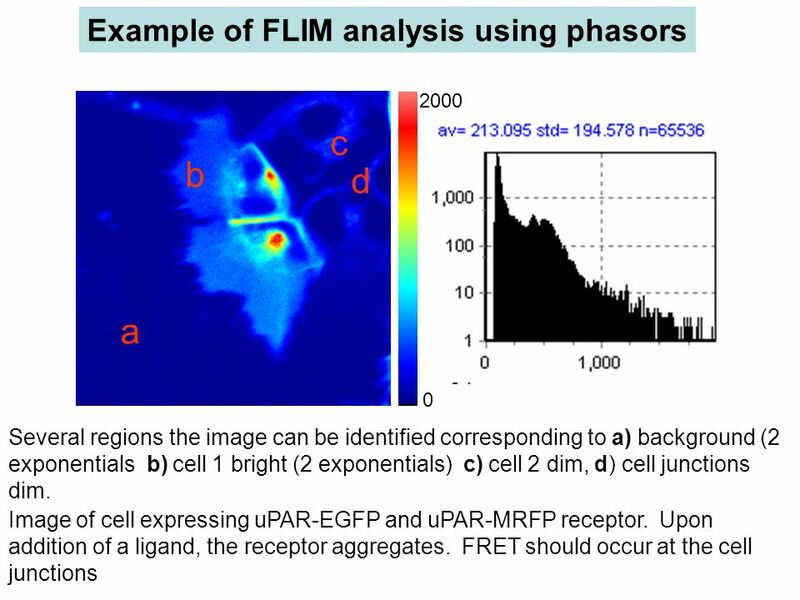 EGFP (green), CFP (blue) mRFP1 (red), autofluorescence (at 880 nm -2photon excitation) violet. 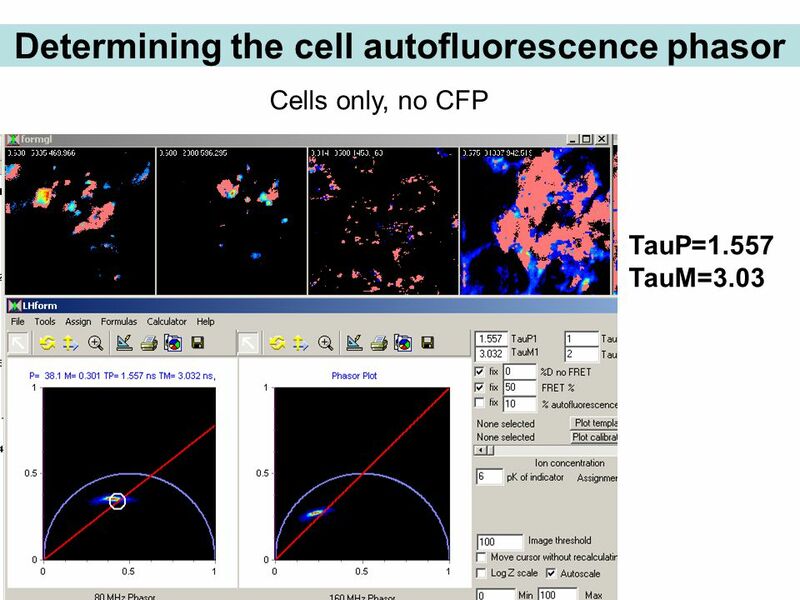 In any given pixel, mixture of EGFP and autofluorescence must be on the yellow line, mixtures of EGFP and mRFP1 must be on the red line. Mixtures of three of them must be inside the triangle with the corner in the 3 phasors. 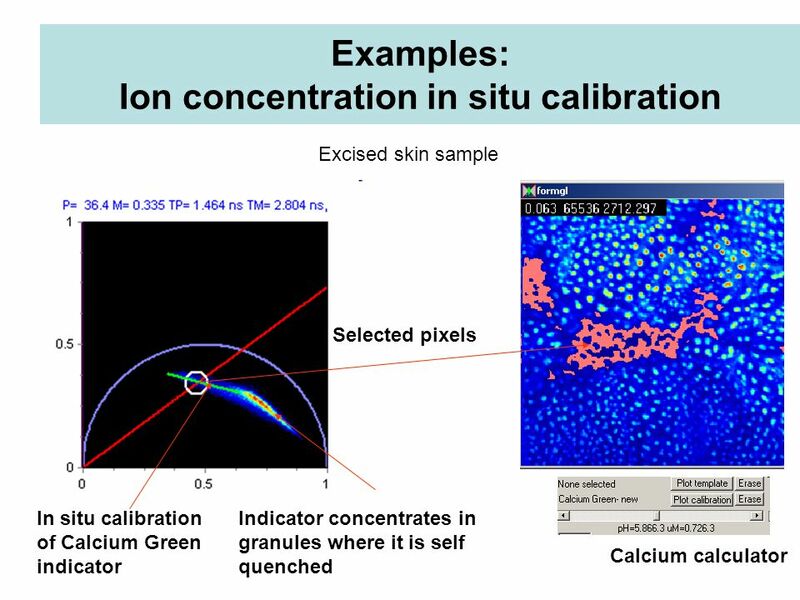 How to identify components? 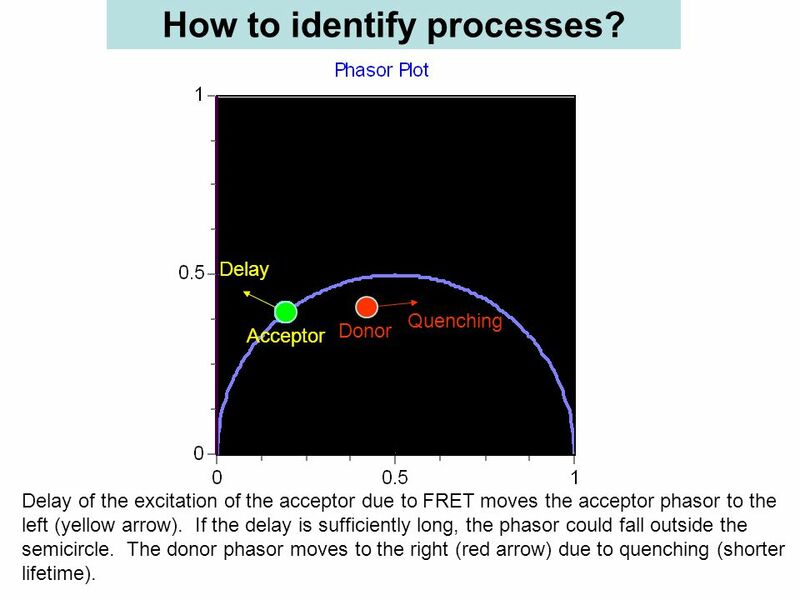 48 Quenching Delay Acceptor Donor Delay of the excitation of the acceptor due to FRET moves the acceptor phasor to the left (yellow arrow). 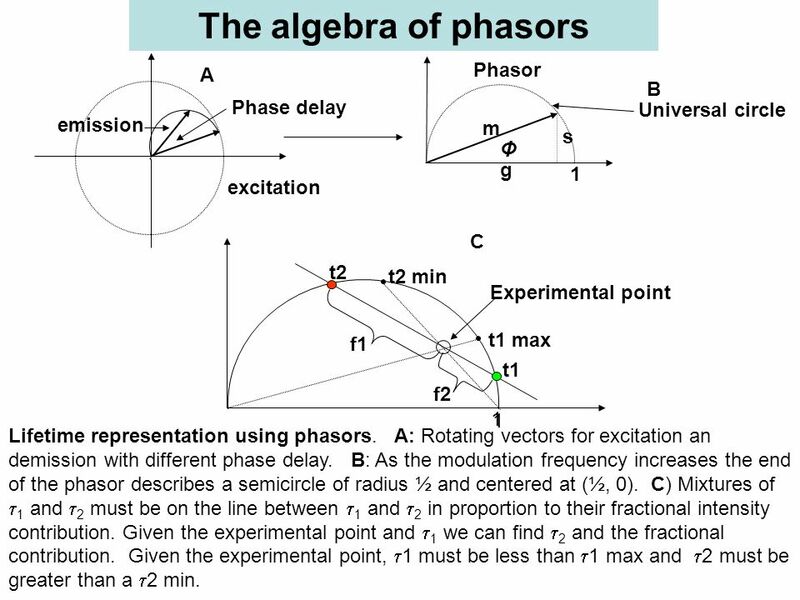 If the delay is sufficiently long, the phasor could fall outside the semicircle. 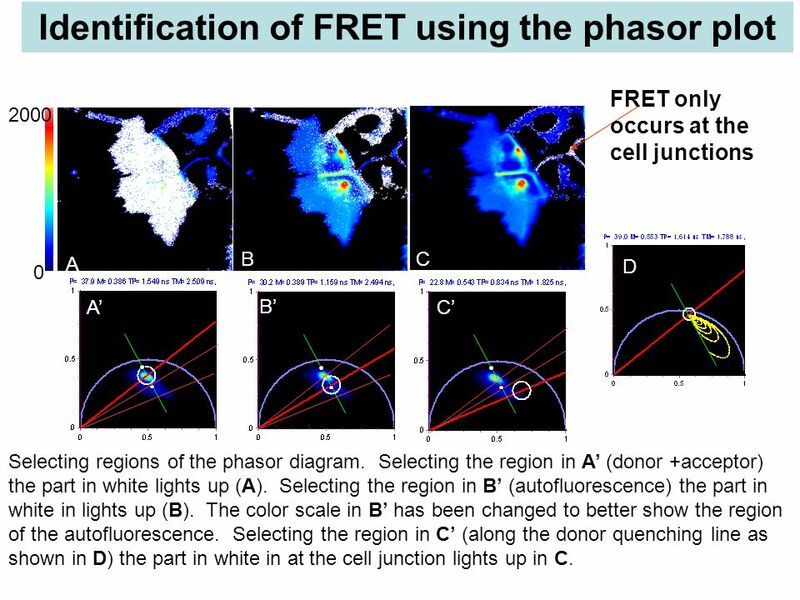 The donor phasor moves to the right (red arrow) due to quenching (shorter lifetime). 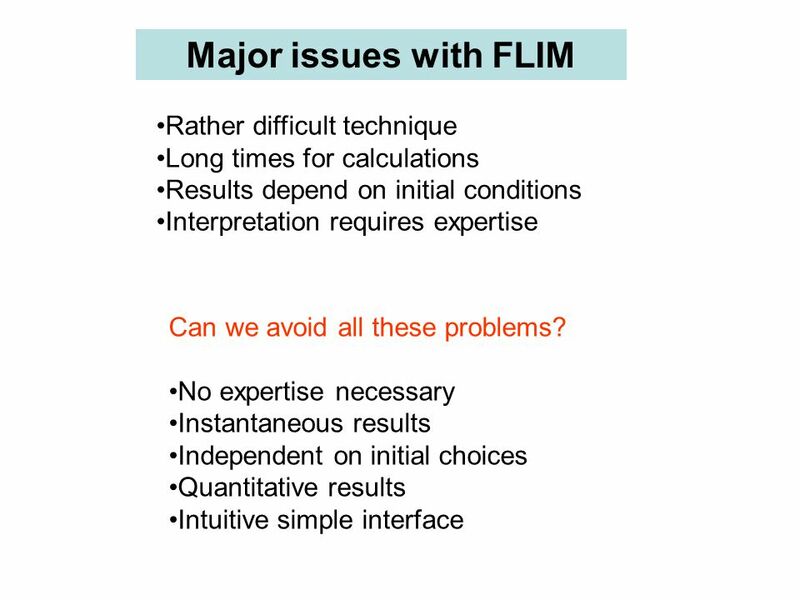 How to identify processes? 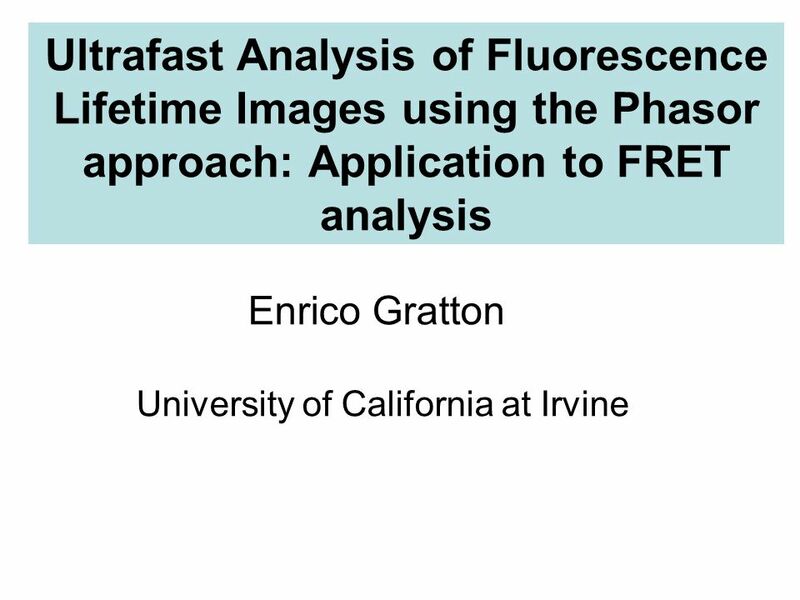 Download ppt "Lecture 8 RICS and FLIM Enrico Gratton Laboratory for Fluorescence Dynamics University of Illinois at Urbana-Champaign First paper on FCS in cells." 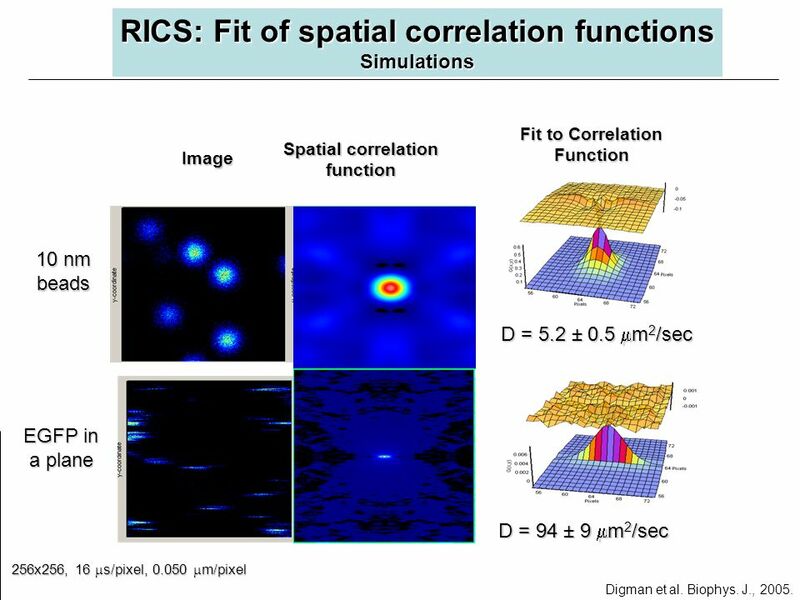 November 12, 2013Computer Vision Lecture 12: Texture 1Signature Another popular method of representing shape is called the signature. 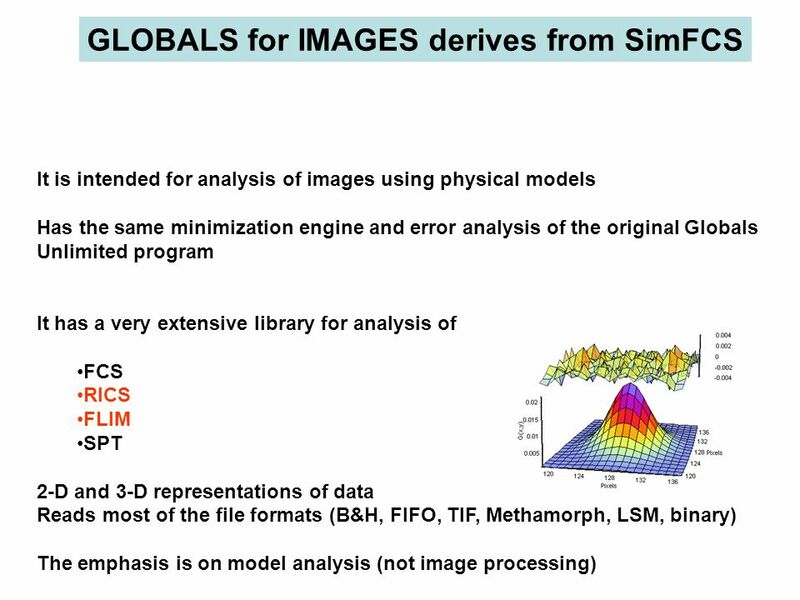 In order to compute. 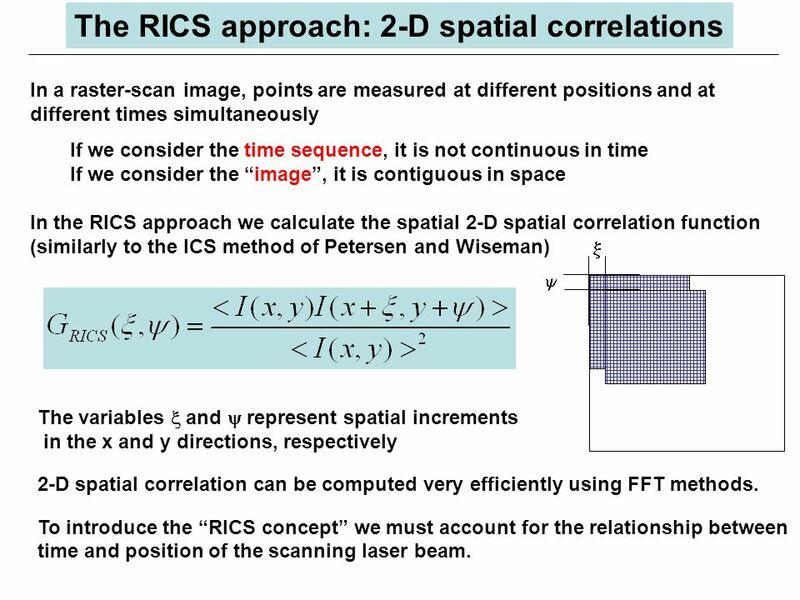 Grey Level Enhancement Contrast stretching Linear mapping Non-linear mapping Efficient implementation of mapping algorithms Design of classes to support. 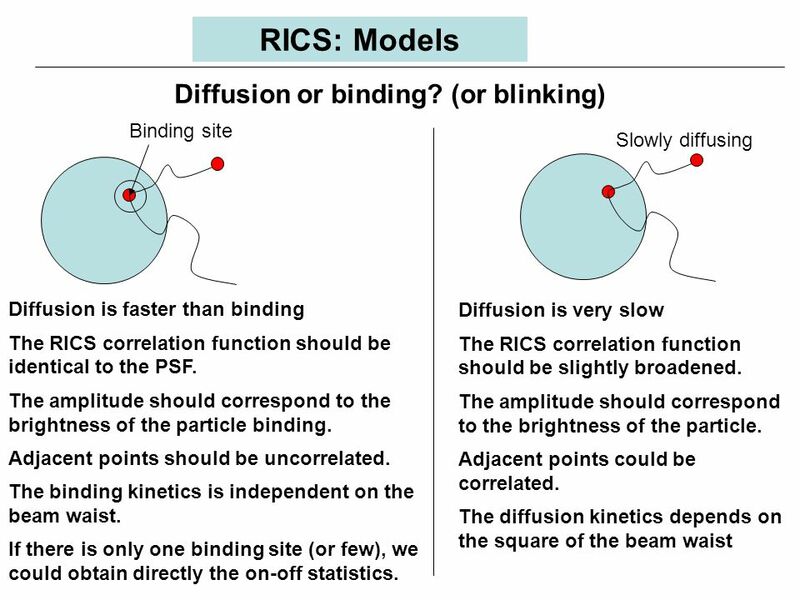 RICS Simulations for two photon excitation. 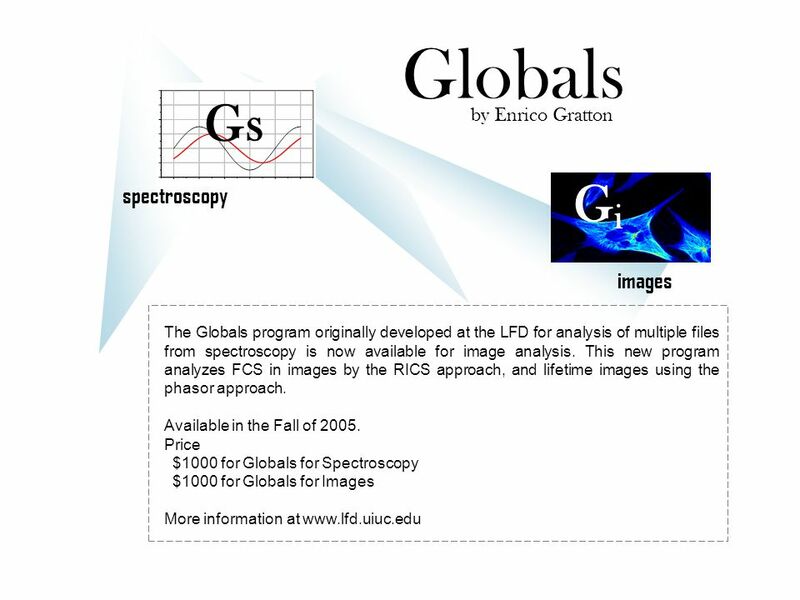 Opening page of GLOBALS for Images program: Click on the SimFCS buttom. 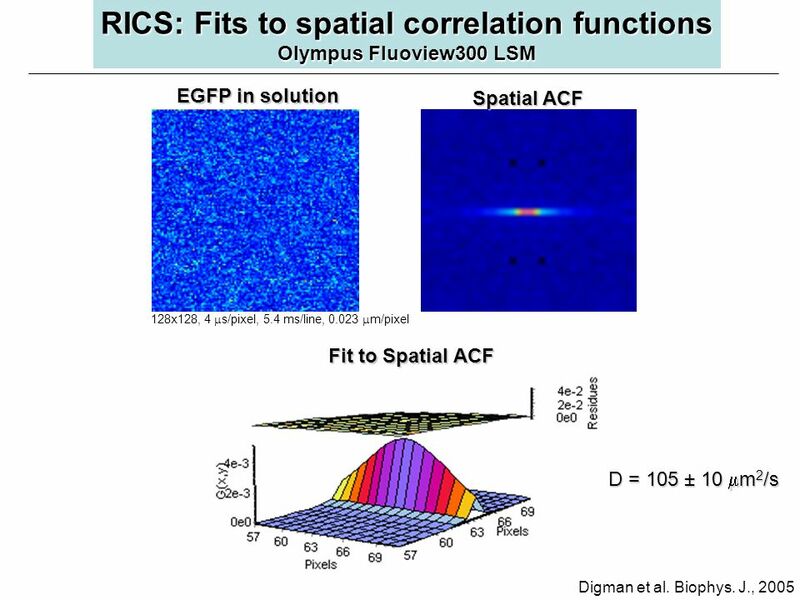 05/03/2004 Measurement of Bunch Length Using Spectral Analysis of Incoherent Fluctuations Vadim Sajaev Advanced Photon Source Argonne National Laboratory. 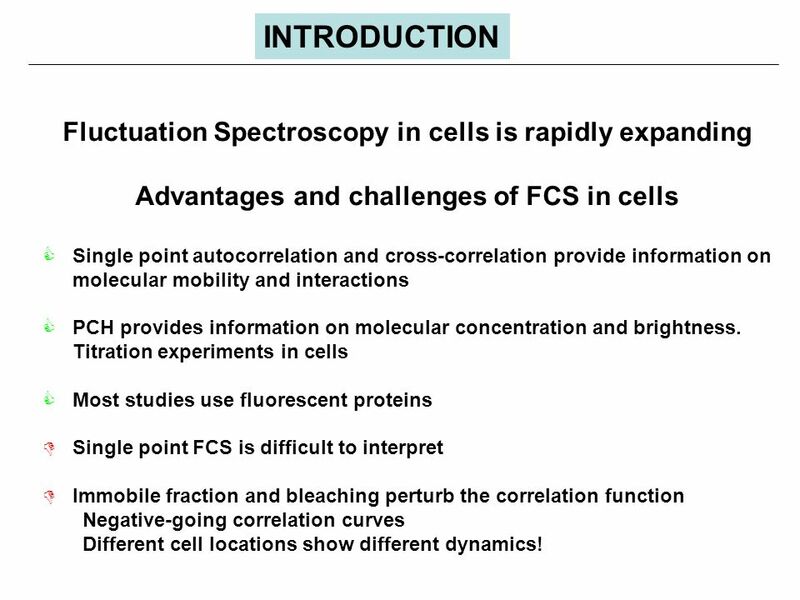 Fluorophores bound to the specimen surface and those in the surrounding medium exist in an equilibrium state. 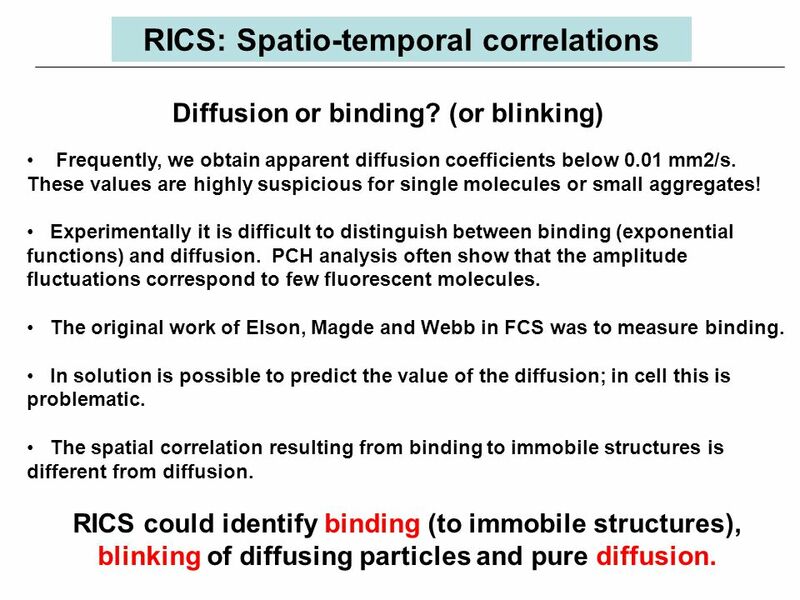 When these molecules are excited and detected. 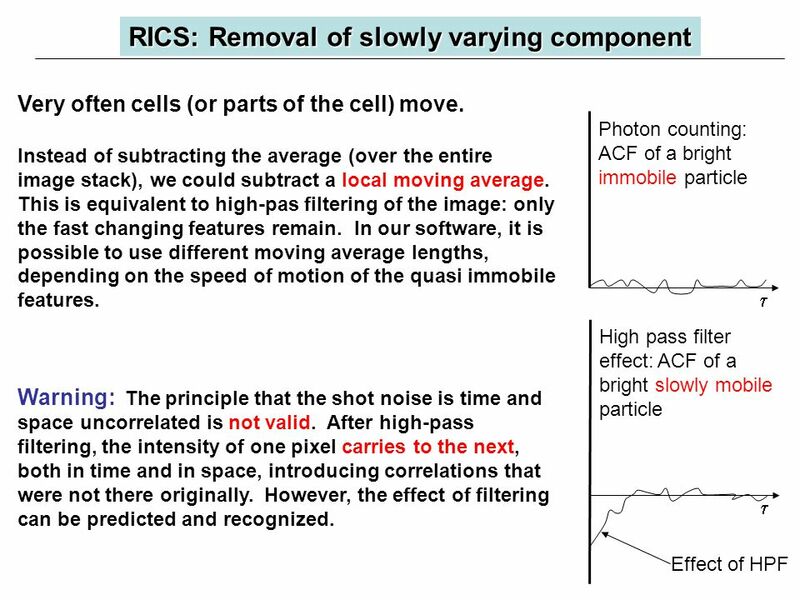 December 5, 2013Computer Vision Lecture 20: Hidden Markov Models/Depth 1 Stereo Vision Due to the limited resolution of images, increasing the baseline. 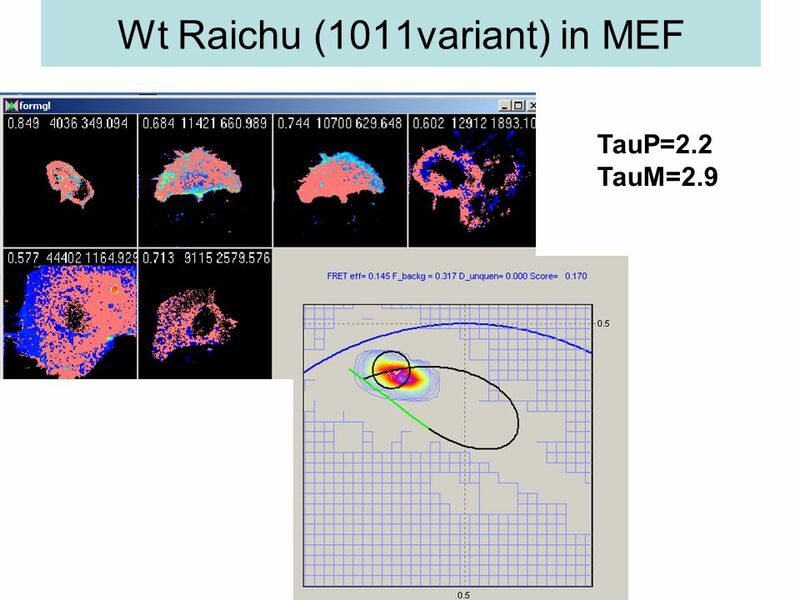 DMEC Neurons firing Black trace is the rat’s trajectory. 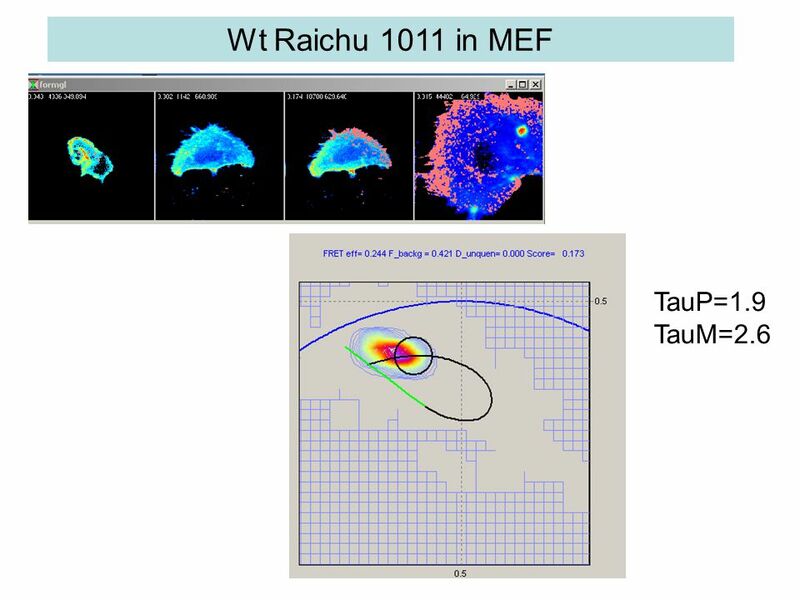 Red dots are spikes recorded from one neuron. Eventually a hexagonal activity pattern emerges. 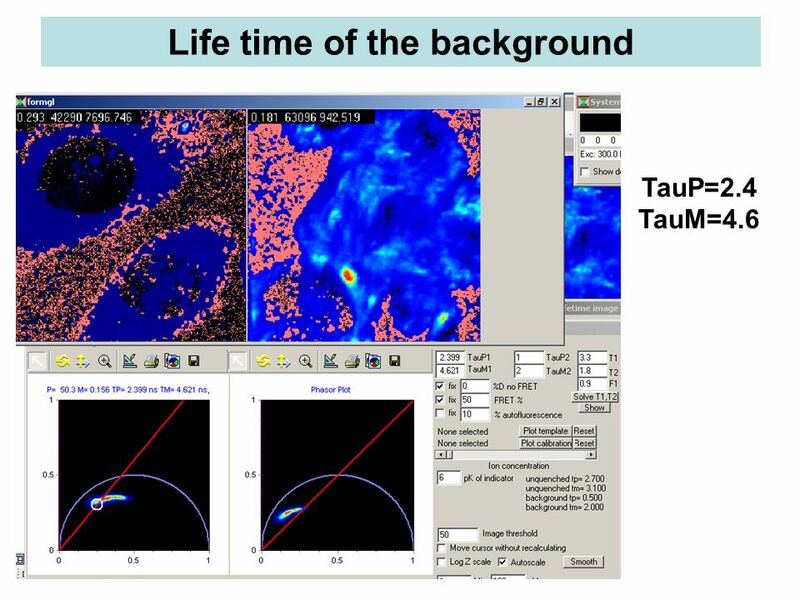 Project Overview Reconstruction in Diffracted Ultrasound Tomography Tali Meiri & Tali Saul Supervised by: Dr. Michael Zibulevsky Dr. Haim Azhari Alexander. 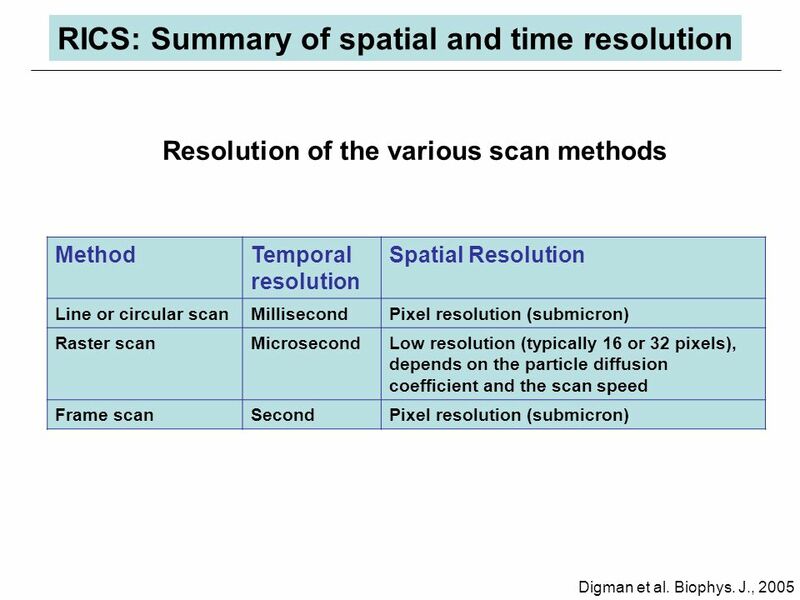 Digital Image Processing Lecture 16: Segmentation: Detection of Discontinuities May 2, 2005 Prof. Charlene Tsai.